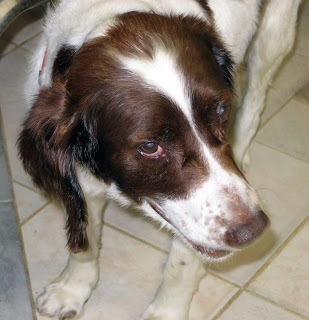 "Bridge" was the name they assigned to the pitifully thin, liver and white springer spaniel with the soulful eyes. Someone heard him whimpering under a bridge in Templeton, MA on a rainy night in late August. He'd beey laying there for many long days and nights, unable to move. Deb Giordano, the town's Animal Control officer, climbed down a greasy ravine and scooped the shivering dog into her arms. He'd been hit by a car, she surmised, rolled down the hill, and been left to die. She determined to save him. There was something in those eyes that said, "Don't give up on me." Deb didn't. She rushed him to the shelter and threw bunches of blankets and towels in the dryer to heat them up. She wrapped the maggot-infested springer in the warm folds, and gradually, he started to look less like a drowned animal and more like an old, tired dog who desperately needed help. Anyone else might have decided that the best way to help him would have been to euthanize him. Not Deb. There was something in this springer's eyes that told her he wanted a chance. She decided he deserved one, in spite of all the odds. Bridge needed extreme care. In addition to the maggots feeding on his wounds, his ears were infected, he was festering with fleas, his joints ached with pain, and he was emaciated. A blood test would reveal the presence of heartworms. It became clear that Bridge's troubles had begun long before he'd been knicked by a car. Two weeks after he arrived at the shelter, Bridge slowly wagged his tail for the first time. That was the sign Deb had been looking for. She marshalled the shelter's limited resources to treat his body, and she devoted herself to nourish his soul. Magically, it worked. Yesterday, several weeks after I first met him, I took Bridge home. As I gently laid him on the soft quilt in the back of my car, I silently told him that he had a proud new name, "Liam." And with that, he let out a big sigh, and contentedly fell asleep. What a wonderful story.Thanks to Deb for her efforts to save him and you for giving him the loving forever home he deserves.